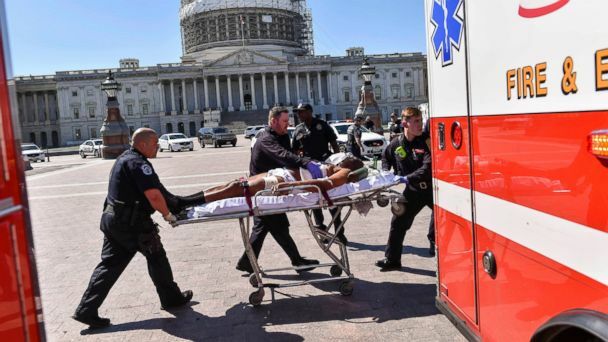 The U.S. Capitol Complex was briefly locked down today after a man drew what appeared to be a gun and pointed it at officers in the Capitol Visitor Center, authorities said. The suspect was shot by officers and taken to a hospital where he is undergoing surgery, Matthew Verderosa of the Capitol police said at a news conference. The suspect's condition was not immediately known, Verderosa said. The suspect was later identified by Capitol Police as Larry R. Dawson, 66, of Tennessee. According to police, a bystander suffered minor injuries and was hospitalized. No officers were injured. Verderosa said the suspect has frequented the Capitol grounds before. Dawson is the same person who interrupted a House session in October 2015, sources told ABC News. The Capitol Building is open for official business only. J.M. Evosevich said he was going through security in the Visitor Center when he was told there was an active shooter. "We all ran out," he told ABC affiliate WJLA-TV in Washington, D.C.
"It's pretty sobering ... most stressful experience I've ever had in my life," he said. With members of Congress out of town, Capitol Police and the Sergeant at Arms had scheduled their annual "shelter in place" exercises for this week and next week, giving some staffers the impression that today's lockdownwas a drill. The Capitol Visitor Center was scheduled to be open for "normal operations" on Tuesday, Capitol officials said late Monday.